While no one knows exactly where the word gazebo comes from, we know that these romantic structures have been garden fixtures for hundreds of years. The history of the gazebo is indeed a fascinating tale. 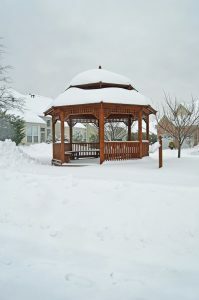 While no one knows exactly where the word gazebo comes from, we know that these romantic structures have been garden fixtures for hundreds of years. While over the years gazebos have been referred to as summerhouses, kiosks, pavilions, pergolas, grottos, pagodas, and more, they actually began as towers or lanterns on the roofs of houses, before evolving into their own free standing structures. Gazebos were common fixtures in Ancient Egypt, over 5000 years ago. Royalty were the first to install them in their gardens to help evoke the image of their garden as an earthly paradise. Similar structures were popular in Ancient Rome and across the east. In tenth century Persian gardens, gazebos were often ornate multi-story structures with marble columns, gold seats, and draped in expensive fabrics. Many were even built over pools and streams so the running cool water would help keep the structures comfortable. Asian gazebos were famously elaborate and a major part of tea ceremonies in Japan. During the Renaissance, gazebos became popular in churches and monasteries. In the 1300s the French popularized the gazebo and they swept across the properties of the wealthy across Europe. In the 1700’s the famously ornate gazebo done in the Chinese style became popular across Europe, but especially in England. This is what led to the long lasting popularity of the gazebo. Early settlers in what would be America had a lot on their mind, and none of it was gazebo related. The realities of surviving and thriving in an unfamiliar and often harsh climate kept them largely occupied. It wasn’t until the mid-1800’s, and the rise of the middle class, that these newly affluent Americans began to consider gazebos. The gazebo, however, did not really catch fire as a property element in America until the 1980’s. The focus was mostly on decks and patios before that point. Today They can be found all over America and the world in various sizes and styles. Do you want a brand new gazebo? Mid-Atlantic Deck & Fence can help!